If you want to read more tips and guides specifically about travel skincare, you can also refer to this post, with additional useful information. Most of you are probably aware of Sephora’s travel and trial section, right before you checkout. A lot of times mini’s are more expensive than the full sized product when you calculate the price per ounce cost. However, if you browse Sephora’s Skincare sets, oftentimes you can find great deals for travel sized skincare. I ordered this from Sephora, and it’s a collection of great skincare products that focus on moisturization. It even comes with a waterproof, plastic bag so if you do encounter a leak, the bag will be protected. Besides the fact that these value sets are better value for your money, you also get to try some new products too! Tall bottles of liquid are out: instead, try making some DIY Toner Pads. Instructions on how to make these are below! No oils: I also stay away from oils because they can be a nightmare if they start to leak in your bag. Instead of makeup removing oils or liquids, I pack a make up removing balm since this won’t leak. This one that I’ve reviewed in a previous post happens to be my favorite cleansing balm! You don’t need to go too crazy packing every single item from your skincare routine if you’re just going away for a short trip. Just remember that lack of moisture causes a myriad of skin issues, so as long as you keep your skin moisturized, you should be fine to leave the heavy duty stuff at home. So with that, let me show you what I’m bringing with me this time around. My trip consists of a total of 7 days, 6 nights and we will be traveling to the Japanese island of Kyushu, where we will visit Fukuoka, the hot spring resort town of Yufuin, and finally, Kumamoto. Double Cleanse – Makeup removal with Clinique’s Take the Day Off Cleansing Balm First up, if you guys don’t know about this product yet, check out this other post I made about my favorite cleansing balm. This is the Clinique Take The Day Off Cleansing Balm. Oils are a no-no for me when I travel because there’s nothing worse than makeup removing oils leaking all over your carry on luggage and ruining your clothes. As long as you don’t go anywhere too hot where these balms can melt, this is by far my favorite way of removing makeup. Then, I wash my face with Tatcha The Deep Cleanse. To finish my double cleanse routine, I follow the makeup removing balm with this gentle, non-drying gel cleanser. What I like about it is that it also has these tiny bits of exfoliating fibers so it does double duty to exfoliate my skin so I don’t have to bring an exfoliator. Use my DIY Toner Pads I made with Hada Labo’s Hyaluronic Acid Toning Lotion that I made to remove any residual dirt or makeup. Tatcha Luminous Dewy Skin Mist I like to also bring a mini mist so I can hydrate whenever my skin feels dry, like on the plane. I like that you can take the top off easily and refill with whatever moisturizing toner you’d like and keep using it long after you’re done with the product! The Ordinary Alpha Arbutin 2% My main concerns are dark spots and uneven skin tone, so for serums and treatments I am bringing The Ordinary’s Alpha Arbutin 2%. It’s small and easy enough to bring along in a carry on. For my nighttime moisturizer I’m bringing Belief the True Cream Aqua Bomb*. These moisturizers are usually tricky to bring along during trips because they’re usually in bulky, heavy jars. I like that these mini’s are super easy to transport and one of them comes in a pump so it’s easy to use. Sunscreen – White Formula SPF 50. You can click here to read all about how to pick the right sunscreen for your skin type! Lip Mask – Laneige Lip Sleeping Mask* Next, this Laneige Lip Sleeping Mask was also part of the Sephora set. I don’t only use it before I sleep, I use it whenever my lips feel dry or chapped as it’s a really rich formula and my lips are constantly dry. Sheet Masks – Sephora Lotus Face Mask* and Too Cool for School Egg Cream Mask Finally, my sheet masks. I love using sheet masks when I travel because of how convenient they are and how effective they are at keeping your skin moisturized. This Sephora mask also came as part of the Sephora value set but one mask won’t be enough for a week long trip so I’m bringing my other favorite mask – Too Cool For School’s Egg Cream Sheet Mask. I’ll use these on the plane, at the hotel, and extra tip – since we’ll be visiting onsen, or hot spring, these are perfect to use while enjoying the hot springs to give your skin extra boost of moisture. Asterisk (*) depicts an item that was included in the Sephora Favorites Haute Hydrators value set – a $103 value that I purchased for $38. This set won’t always be available – they are usually limited quantities. If you just search the site however, there are usually sets of skincare products grouped together at a great value. Now, for the fun part. If you’ve ever had to leave toners at home because you didn’t want to bring along bulky bottles of liquid, you’re not alone. But I didn’t want to compromise my skincare by not bringing this key product with me, either. So my solution? DIY Toner Pads. All you need to make these DIY toner pads are: your favorite toner, an empty screw top container, and some cotton rounds. First, make sure that your container is clean, so wash out whatever was inside before and let it dry completely. I use an old RMK loose powder container that I rinsed out with soapy water and let dry. Then, estimate about how many cotton rounds you will need. I use cotton rounds about 1-2 times a day so I’m going to make about 10 cotton rounds. Pour enough toner into the container so that it’s about half full. In my video demo below, I used Hada Labo’s Hyaluronic Acid Toning Lotion. Then, put the rounds in the container about 2 at a time and allow them to soak up the toner. If needed, pour additional toner over the top so that all of the cotton rounds are soaked through. It will be easier here to use a toner where you have a wide opening or can screw off the top easily. After you’ve soaked all your rounds, screw on the cap, and toss it in your makeup bag. Take one out whenever you need it and this way, you don’t have to take along bulky bottles or check your bags! If you are careful to screw the cap on securely, this is also much less likely to spill or leak in your luggage. 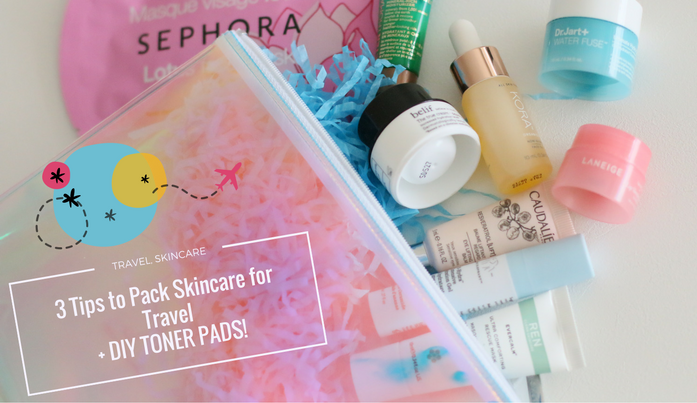 Click below to watch the video of how I pack my skincare products for travel, as well as the DIY Toner Pads hack in action!